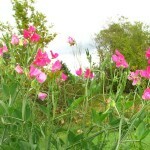 The growing season gets a slow enough start around here that many annuals don’t really strut their stuff until September. This is a real liability for the frost-sensitive ones like cosmos. I learned to seek out early blooming varieties because the old-fashioned ones often only had two weeks of bloom before shriveling in the first frost. On the other hand, many of the spring bloomers, enjoying the return of cool evenings and plentiful rain, make a comeback. 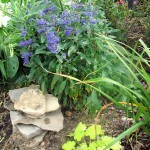 This includes pansies, foxgloves, mountain bluets, and catmint. Click on any thumbnail for a medium image, and click on the medium image for an even bigger one, if you want to see detail. If you click on the first thumbnail, you will be able to go through all of them without coming back to the main post to click the next one. 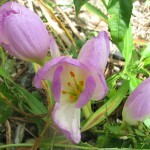 If you want to see more colchicums, browse through the photos at the very bottom of this page (in the footer) or look through the Colchicum category in the sidebar. 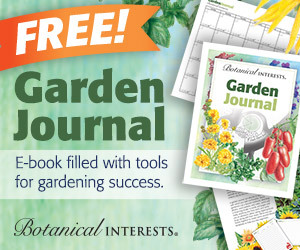 Visit May Dreams Gardens to see what other gardeners are growing this month. You have so many things blooming now. Your mention of Malva reminds me that I forget to list mine. 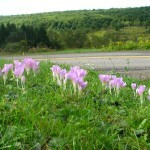 I love your Colchicums. I have only one type, and those are actually belong to the boy. They’re the only plants he’s enthused about. At least he has good taste, as I’m sure you’ll agree. I always know I’m going to see some interesting, beautiful things over here! 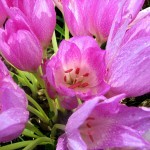 I really do need to purchase some of those colchicums. They’re very special, aren’t they?! 🙂 Have a great day. Those colchicums are just gorgeous. I can’t grow them on MCOK so it’s a treat to see them in your garden! Annie, this is my first experience with caryopteris, and I haven’t noticed the color varying when the nights are cooler. I will admit that sometimes it looks bluer and sometimes more purple. 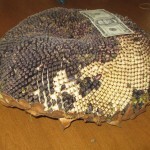 I took a picture of the corm once, but I guess I never posted it here. I’ll have to remedy that some day. Karen, I know a lot of people grow colchicums in the Pacific Northwest, so I’m not sure why you’d have trouble. Sometimes mine don’t bloom the first year after planting, but they usually do after that. I’m jealous of your colchicums, mine never seem to come back after the first year I plant them. I’ll keep trying, though, for that spectral, luminescent color! Congrats on yours, they are gorgeous. Do you think the caryopteris is bluer with cooler nights? 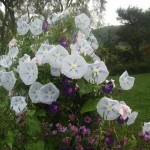 It looks great in the photo and so do the starry morning glories. Kathy that clump of cochicum from Byzantium is amazing – it would be interesting to have X-ray vision and see what the bulbs look like under the earth! Who is eating Owen’s sunflower seeds? Birds? 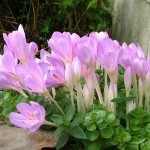 I do love the colchicums! 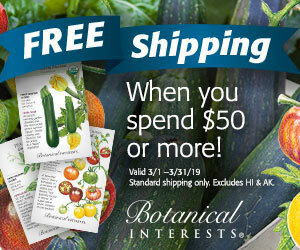 I’m going to look in the catalogs for more to buy next year. Thank you again for getting me started with those. 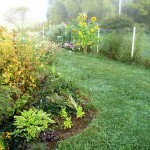 We had a misty, dewing morning this morning, and it seemed to stay that way all day. Bleh. Tomorrow the sun should be shining again.